The Tom T gas station at the corner of Union Street and Fourteenth Street in Bangor. A developer of grocery and variety stores across eastern and central Maine hopes to leave his mark on the Queen City, but his efforts have met some resistance from people who would live near the project. Chuck Lawrence, owner of the Tradewinds chain, has been working with the city to replace the Tom T convenience store at the intersection of Union and Fourteenth streets, which also includes an Irving gas station. In its place, he wants to keep the gas station and build a new Tradewinds convenience store that’s farther back from the road. Lawrence hopes to tear down an abandoned, neighboring home and convert two others into employee housing. 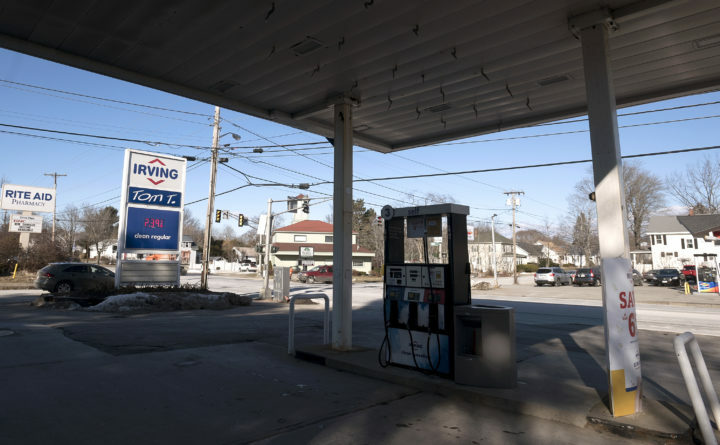 His company already owns the gas station and the three neighboring properties on which those homes sit: 548 Union St., 108 Fourteenth St. and 19 Frances St. The house Lawrence would tear down is at 548 Union St.
After some residents opposed or questioned the project at last week’s planning board meeting, its engineer withdrew an application to rezone the properties. During that meeting, several residents who live near the project objected to traffic and other changes that could come from a new convenience store with additional parking. The planning board eventually voted 3-2 against a recommendation to approve the rezoning. The Bangor City Council was due to consider the proposal Monday night, but it was taken off the meeting agenda after the rezoning application was withdrawn. Originally started in Blue Hill, the Tradewinds chain now includes 13 locations across the state, according to its website. In a phone call this week, Lawrence said he plans to meet with residents near Tom T store to hear their concerns. He also wants to revise the language of the rezoning proposal to emphasize that the two homes on Frances and Fourteenth streets would not be demolished. “I will do whatever is right for the community,” he said at the planning board meeting.